A standing desk can help you combat the health risks associated with sitting all day, including obesity, blood clots, and back, neck, and shoulder pain. Using a stand up desk while you work will help you burn more calories, increase energy, promote healthy blood flow and respiration, and increase mental clarity and focus. While standing at your desk has been proven to help improve a person's health and increase productivity, the key to staying healthy at work is to keep active with a fully-adjustable ergonomic workstation. The most popular desks for standing we offer are adjustable height standing desks, also called sit-to-stand desks or stand up desks. These desks allow you to go from a sitting to a standing position with ease. Research has shown that transitioning from sitting to standing throughout the work day is preferable to sitting or standing all day. Our solutions allow you to stand at your desk and sit as well -- it's the best of both worlds. Your work is important, which is why it's crucial to make the most of your energy and focus while you're on the job. Our stand up desks are more than ready to help you reach peak levels of concentration and focus, just by adding a little height into your daily work routine. Ergonomic experts recommend standing for 15 minutes for every hour during the day, which improves blood flow, increases energy and focus, and leads you to better work. Don't miss out on the chance to improve your productivity; work better with UPLIFT Desk. Your work might keep you at your desk a majority of the day, but that doesn't mean you have to stay stuck in one position. Get out of your chair and burn calories while you work with the help of a height adjustable desk and treadmill desk from UPLIFT Desk. Standing can burn up to 15 more calories per hour than sitting, and walking can burn a whopping 130 more calories! But it's not only calories you should consider. Staying active at work can give your body better blood sugar control, and you'll likely suffer less back and shoulder pain. 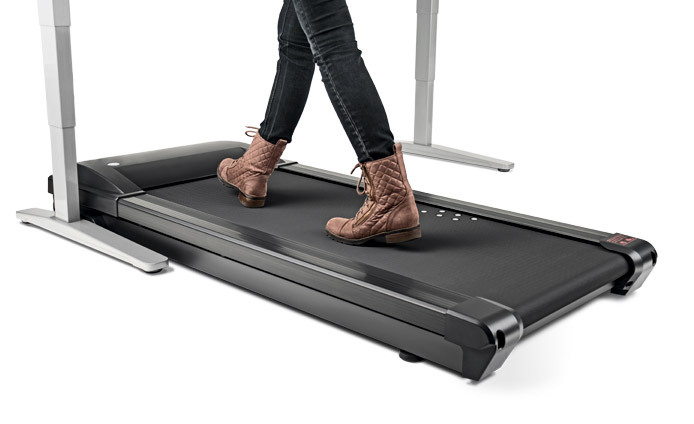 Walking at the office is yet another way to increase circulation and improve your energy level. Get moving with a little help from UPLIFT Desk. Human Solution's ergonomic experts recommend standing at your desk for at least 15 minutes every hour during a regular work day. 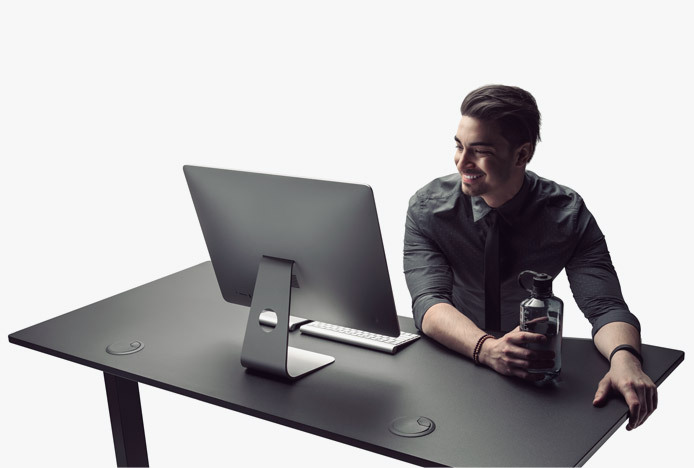 Our sit to stand desks are designed to encourage you to stay active while you're stuck at your desk. Many of our adjustable desks are electric and can easily go from sitting to a perfect desk height with the push of a button. Others offer fingertip height adjustment with no need for an electric power source. Adjustable height desks, help anyone combat the dangerous health issues associated with sitting all day. More and more people are switching to a standup desk every day because of the productivity and health benefits that going from sitting to standing can provide. Choose the perfect UPLIFT Desk for you, and watch it take shape before your eyes with one of our desk builders. If you currently have a fixed height desk, and just can't get rid of it, we recommend trying a standing desk converter. Select a desk below to start building! Making the Big Change to an Adjustable Height Desk? Here are Some FAQs!